Big Boy is just that … BIG! 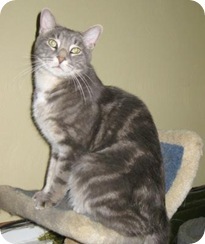 He is a tall, Gray and silver classic tabby. He has almost perfect circles too. And he is such a nice cat. Big Boy came to us front foot declawed. He has good liter box habits. He does well with dogs and cats. He moves with grace and eloquence. He is a gentle spirit. Big Boy is neutered, up to date on his shots and his test for Feline Leukemia was negative. He is also micro chipped. Big Boy appears to be two years old. I was going to rename him but Big Boy just stuck. It is not that he is wide but that he is tall. He is sure to make someone who loves cats very happy.